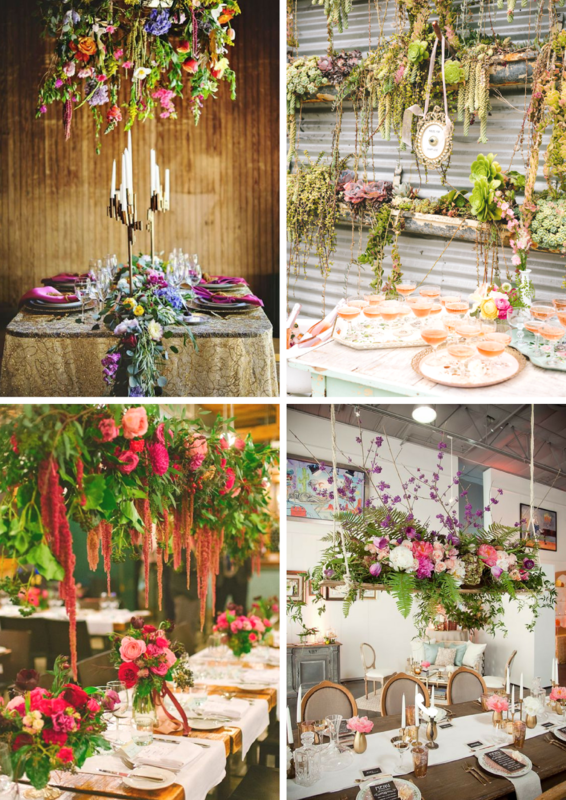 We’ve been seeing the hanging floral trend everywhere recently, it’s all over Pinterest and in the big budget bridal magazines. 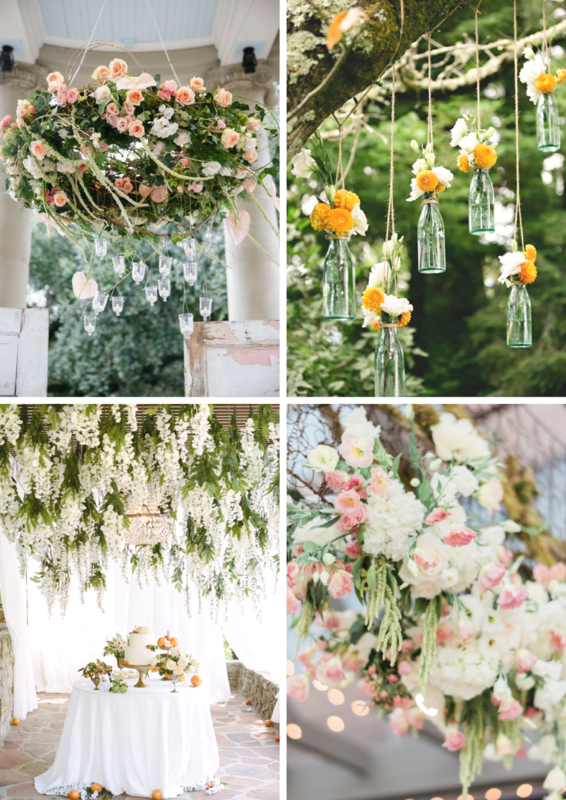 I’ve collected lots of inspirational images and split this trend into three different styles so no matter what your personal taste is, you’re bound to find a way to introduce hanging flowers into your big day. First up is boho style flowers. You really can do what you want with this trend, the main points to remember are; keep it relaxed, used mixed blooms and texture, and have fun with the shape of the display. I love the idea of introducing cacti and succulents, too. 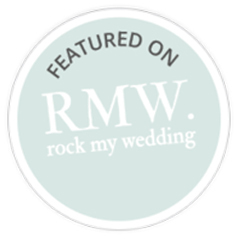 For a laid back vibe mix in floor cushions and other low seating options to keep the atmosphere intimate and fun. Macramé hanging planters work perfectly with this style, you can either have them lined up above a table or dot them around your venue for a layered effect. 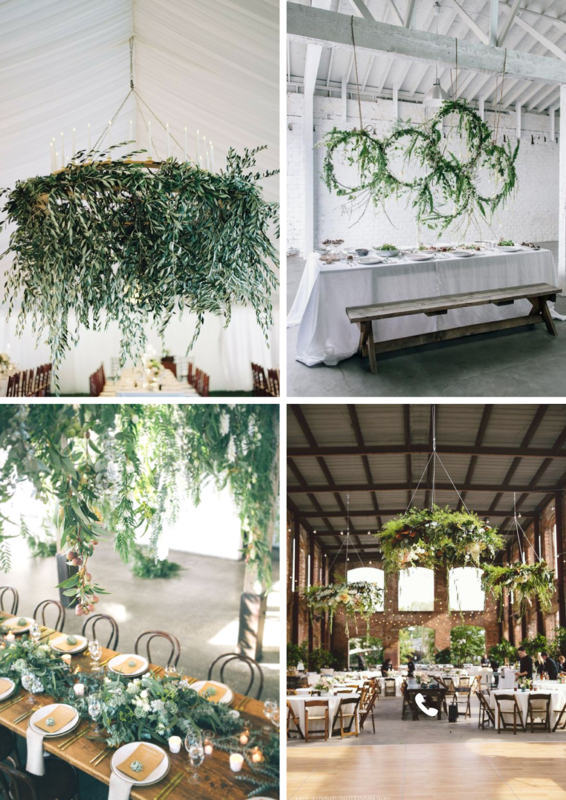 I also love the idea of suspending a plank of wood to house a mixture of ferns and pretty flowers. Remember to have fun with this style, it’s all about mixing colour, texture, shape and height – flowing and natural rather than preened and precise. Next we have the hugely popular greenery trend, this style is only going to grow and it partners perfectly with hanging flowers. As foliage is very tonal, it’s important to use a mix of textures to stop your displays looking too flat. I suggest a mix of ferns, olive branches, eucalyptus and bay tree branches. For even more visual depth introduce green fruit, herbs, seed pods and grasses, your guests could even use the fresh herbs in their food (or drinks!). 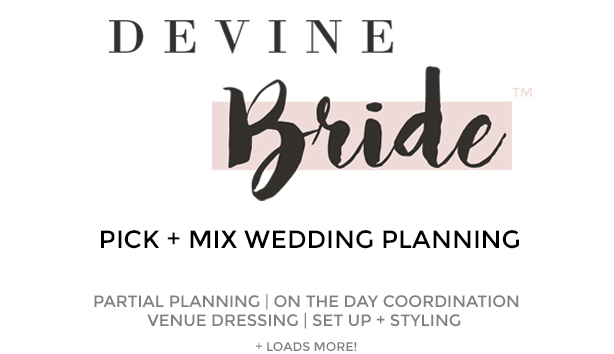 There are plenty of display options with this style but I’ve seen a lot of oversized hoops suspended above tables (so much so I’ve referenced them twice above! ), and also heavy gathered garlands. I also absolutely love the green balloon tails too! 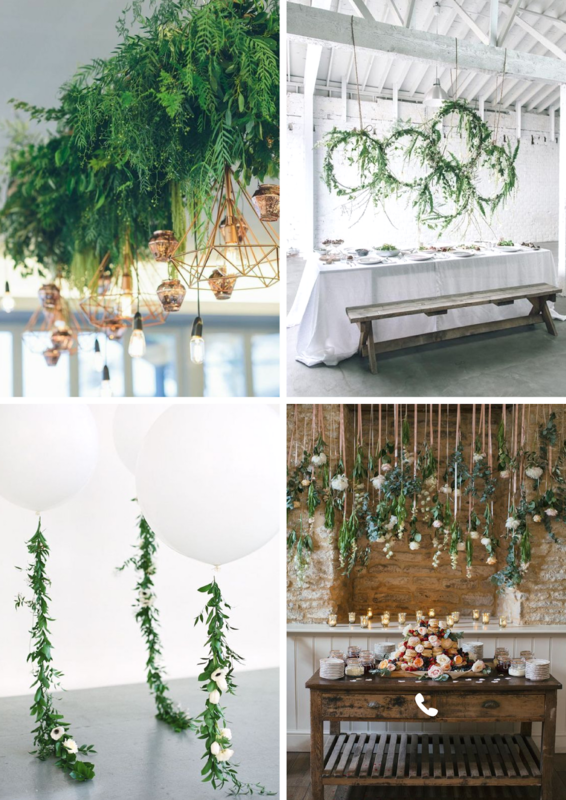 This style is all about texture and different green tones, due to the natural style this foliage trend would suit relaxed informal weddings best. 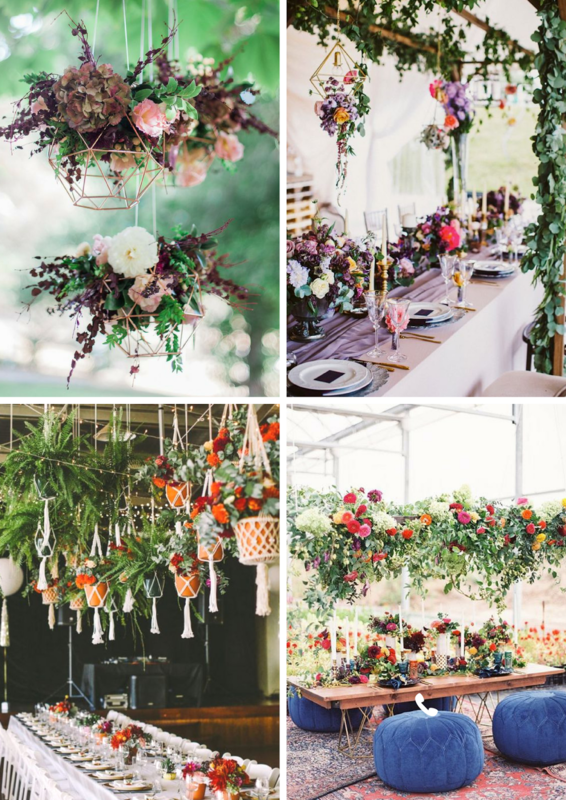 If you want to create more traditional wedding styling, there’s no reason why you can’t introduce hanging floral displays. Although this trend is quite modern, there are ways to achieve a classic look. Large sweeping garlands and wreaths are two very classic display ideas, and if you combine these with traditional wedding blooms like roses, peonies, lily of the valley and ivy you’ll end up with a classically beautiful and perfectly elegant display. 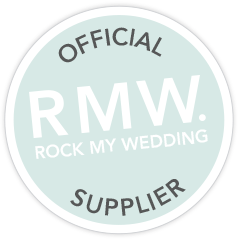 A traditional wedding is also the perfect opportunity to make the most out of decorative props like bottles, lanterns, birdcages and ribbons which can all be suspended along with the flowers. 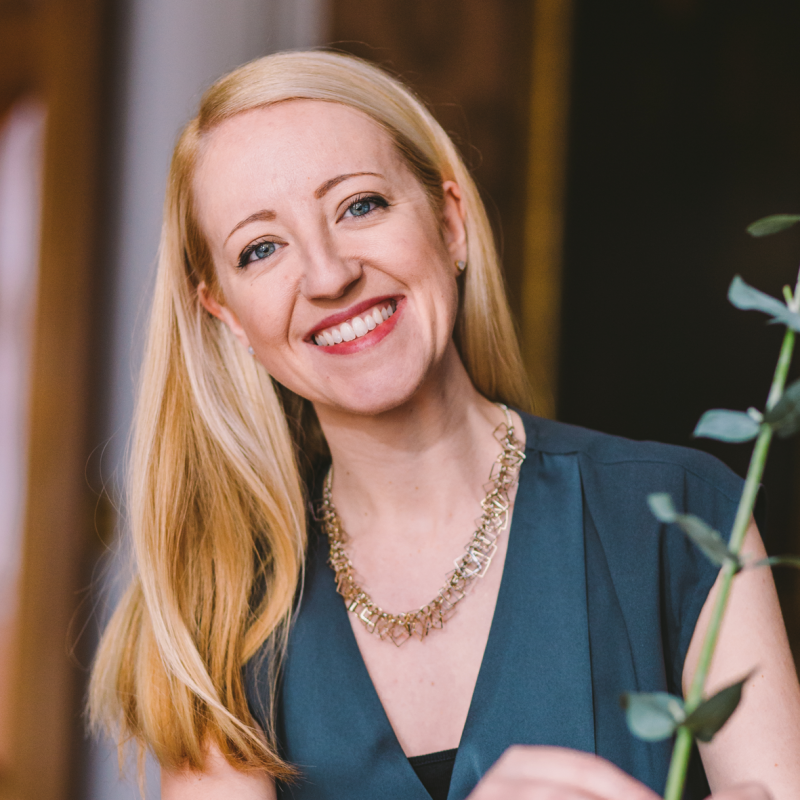 To keep things looking classic and traditional, you could use vintage styling and flower arranging techniques. Neat, round displays are timeless and if you introduce a few trailing pieces the whole effect will look very romantic. 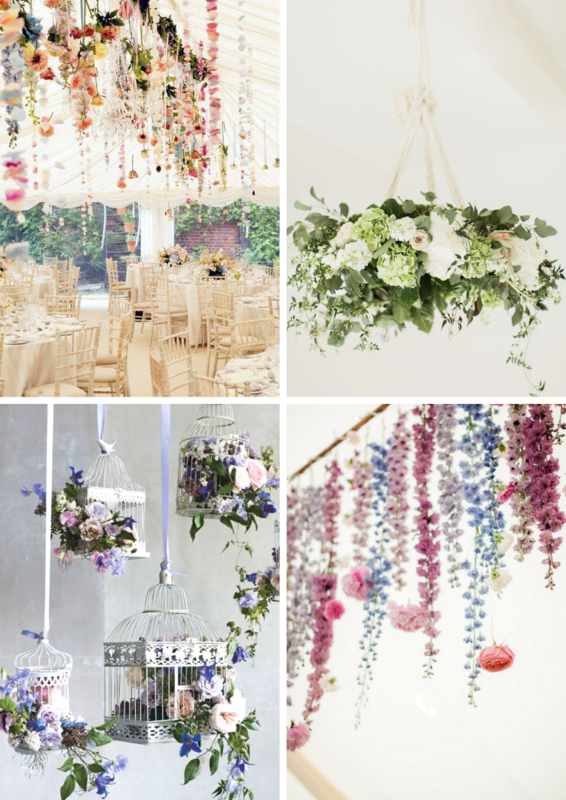 I hope you liked this post, and if you need any more hanging flower inspiration have a look at our Pinterest board here. I am absolutely in love with hanging flowers and can’t wait to create a few variations of this trend at my next few weddings!